In our last post, we established the context for our exploration into the lives of the super-rich. We saw just how wealthy the 1% at the top is in comparison to the rest of the world’s population. In this post, we shall try and decode their consumption habits and gain deeper insight into the mind of the luxury shopper. Thus, these people spend considerable amounts of money on things others might consider luxurious. If you thought only the Americans and Europeans were crazy about luxury, the super-rich in Asia are also quickly getting up to speed with the west. Japan has long been one of the biggest markets for luxury goods in the world, and India and China are fast catching up thanks largely to growing economies and young populations with large expendable incomes. However, it’s not just the amount of money they spend, but the manner in which they spend it that suggests the lengths this segment is willing to go to in order to satisfy their desire to consume. Shahnaz Husain, Cosmetics Diva, has a Louis Vuitton collection in her wardrobe—not crafted at any factory of the French fashion giant, but at her bungalow in South Delhi, designed by herself and stitched by an in-house tailor. She always buys LV Bags in pairs: One to be used as a bag and one to be cut up and shredded for use by her tailor. Diljeet Titus, one of Delhi’s top lawyers, has bought 40 handsets of luxury phone brand Vertu in the last couple of years. Vertu phones in India cost between INR 3 lakh and INR 66 lakh. Titus also loves to splurge on luxury watches, suits, phones and vintage cars for himself. A lady in Delhi sent 3 specially imported Hermes Birkins worth INR 60 Lakhs to a family friend whose daughter’s wedding she was unable to attend. She also sent an apology note. This is not just a Delhi phenomenon, although Delhi is fast establishing itself as the nation’s luxury capital. The Delhi stores of most luxury brands with a presence in India are their best performing stores in the country today and cities like Bombay and Bangalore are only just catching up. 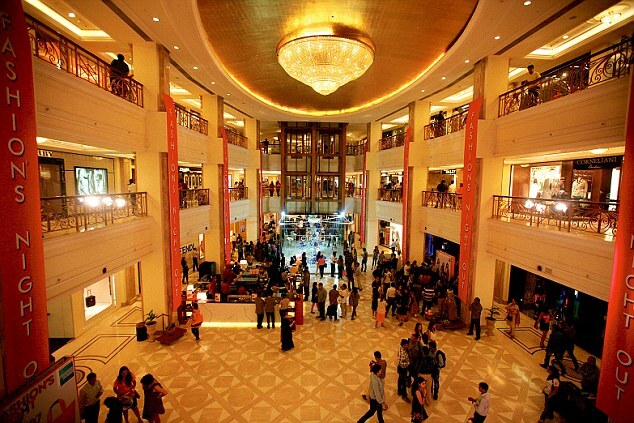 As far as luxury malls are concerned, Delhi’s Emporio, Mumbai’s Palladium and Bangalore’s UB City are the most preferred destinations for luxury brands seeking to open in the country. Data gathered from one of the world’s top apparel brands with operations across India suggests that approximately 55% of all revenues come from a small portion of the total customer base (~10%) and spending is concentrated even further amongst the top 1%. Interesting anecdotes from those in the industry bear this out. One customer, for example, a rich businessman from the Mumbai area spends approximately 2 million INR annually at just 1 store of a brand selling premium casual wear, in addition to shopping at the brand’s stores in Thailand, London and at other locations across Europe. Another customer in a different city once deposited approximately 1 million INR at a certain luxury brand’s store in cash! He said it was too inconvenient for him to carry cash around every time he had to buy something. Even more surprising, he used up his store credit within 90 days. A 2008 research amongst affluent households (Household Income >$100K) and Super-Rich Households (>$250 K) also provides keen insight on the media consumption habits of the Super Rich, as compared to the affluent. The richer one gets, the more time one tends to spend reading and surfing the web, versus time spent watching TV and listening to radio. The Super Rich Customer’s wallet is the Holy Grail most luxury marketers are after and the quest isn’t an easy one. “What do you sell to someone who has it all?” is the question most are trying to answer. In the next post, we shall take a look at what Luxury and Premium Brands the world over are doing to serve this ‘Over served’ segment.